Between 2013-2014, researchers at West Coast Grapes conducted a trial using Menefee Humate™ and SeaMate Fe on grapes in Modesto, California. 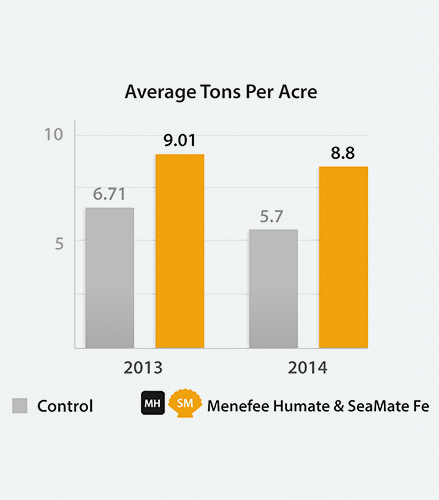 Treated rows experienced a 34% increase in yield with Menefee Humate® + SeaMate Fe in 2013, and a 54% increase in 2014. Rows treated with Menefee Humate® and SeaMate Fe experienced veraison quicker and more consistently. Additionally, treated rows showed more consistent sizing and bunching, and they degraded at a significantly slower rate than control rows.